Last year, I visited a cultural tourism site in the area of Garut, with my mother and my sister’s family. The place is called Cangkuang temple. I had heard about it a long time ago, but I just got a chance to visit it recently. Along with my sister’s family, we left home early in the morning. The car was occupied by eight passengers, with my brother in-law behind the steering wheel. He drove fast yet smoothly on the road. We passed through the highway, heading to Leles/Garut. After passed through a rather small entrance road (not a very smooth road), we asked for direction to ensure that the route we’re taking is the correct one which will bring us to the place we are headed. Soon we arrived to our destination, Cangkuang Temple tourist area. This temple is located in an island in the middle of the lake (well… it’s actually not a real island, because we can still go there by land, taking a longer route, circling the other part of the ‘island’), with a small township consists of only seven houses. It is called Kampung Pulo (Pulo village). The ancestors of that place were a muslim, named Arif Muhammad. The grand great great great children of him (I’m sorry, I don’t have enough data about it) are staying in that village until now and still continuing the customs and culture brought by their ancestor. We can find the grave of Arif Muhammad there, who is a muslim, in the middle of the Hindu temple. Quite interesting. 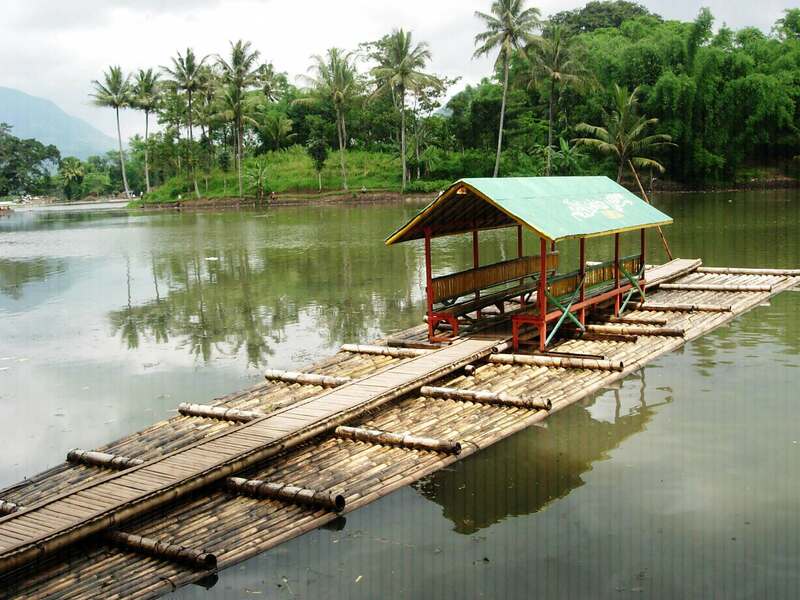 Cangkuang Temple and Kampung Pulo are located on a small island in the middle of Cangkuang Lake. We can use the service of a small raft boat to reach the island. It was an exciting experience for my little nephew. He had fun walking along the edge of the sloping bamboo raft, while we were sitting on the bench at the center of the raft, under the simple roof. All rafts at the area are designed that way. Reached the ‘island’ we found many stalls selling souvenirs. There are also one small museum near the temple which stores important artifacts relating to the Cangkuang Temple’s history and the origins of this Kampung Pulo. There was manuscript of Friday sermon written on the goatskin or a part of holy book written on pieces of barks. There were also some pictures of the temple taken on different period of times. One of my nephews has hobby on collecting key-chain. There were some special designs available in the small shop in front of the museum. They also buy cheap T-shirts with the image of the Cangkuang temple (to be honest, I think the price is relatively cheap considering the quite fine quality of the t-shirt). It became a proof that we really visit the site. My nephew also bought a miniature of Cangkuang temple. For my own interest, I’d like to buy a mug there, as I like to collect mugs, but finally couldn’t do it because I was too busy taken care of my smallest nephew who were very lively and energetic boy. One more special custom in the village is the rule that apply to the position of indigenous houses. There were seven simple houses allocated to the children of the ancestor of the village. The village must always consist of six women houses and one male house. Those 7 houses were located in the certain form of simple whitewashed houses lined face to face, three on the left and three others on the right and completed with a mosque (house of the male). The number of houses should not be added. It must be remain six in number and the six existing houses should not consist of more than six families inside so that when one of the family member getting married, he/she has to leave the village. According to the rules, the houses are owned by women, not men. Another rule in the village is, they should not be hitting the gong (a traditional musical instrument, part of gamelan) and cannot maintain four-legged livestock. Once I noticed, there were no cows, goats, dogs or cats in the village. 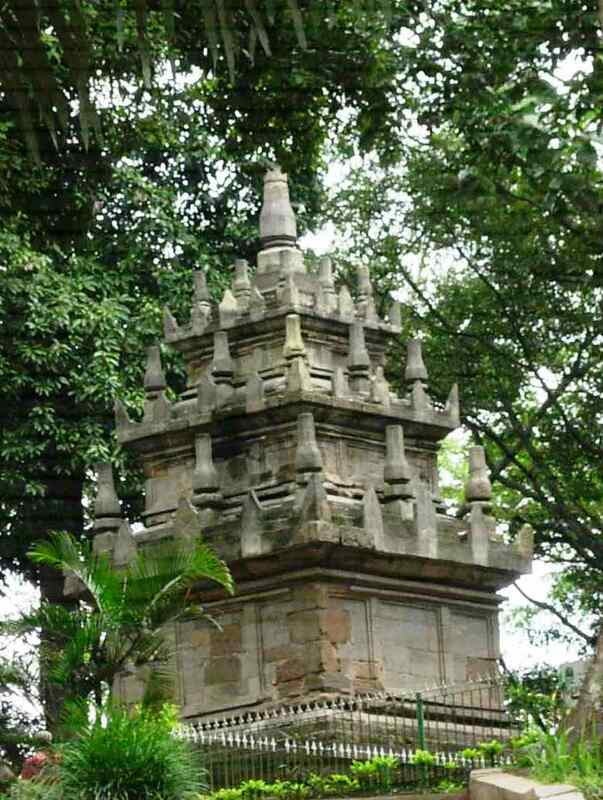 Cangkuang temple, along with its Kampung Pulo saves the values of tradition that still firmly held, timelessly. 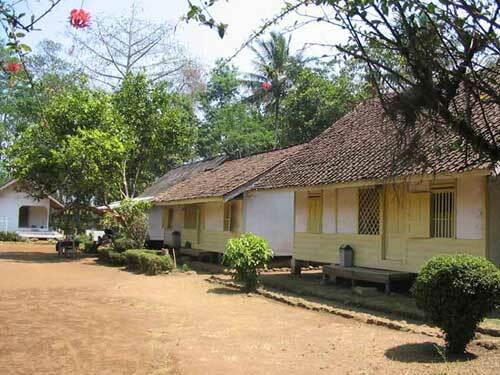 By now, the site becomes one of the protected cultural sites by the West Java Tourism Office. I hope people in modern times can learn and take lessons from their simplicity and apply it into their lifestyle. This article also being published in southeastasia.org. Feel free to visit it here, read and give comment and vote. This entry was posted in Travel and tagged attitude, culture, family, travel. Bookmark the permalink. Terima kasih atas kunjungannya ya, juga sanjungannya. I’m flattered. Itu dia, yang saya maksud dengan ‘tersindir’ oleh poin nomor 4 di postingannya sukangeblog, saya juga suka bikin banyak blog. Versi Indonesia dari blog ini (nggak persis-persis amat sih…), bisa dilihat di dunia-batikmania.blogspot.com. Silakan berkunjung. tp keren mba, mempromosikan wisata di INdonesia dalam bahasa Inggris. hhmm nice journey, keep writing sist!